What is Sacred Sound? How can Sacred Sound heal the mind? Sacred Sound is sound vibration created with blessed intention and high vibratory content. Often a chant or phrase is spoken quietly or repeated audibly for several minutes to set the intention of the sacred sound bath. 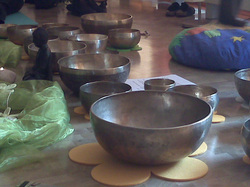 The sacred sound bath may include chant, gongs, singing bowls, drums, and more. Sacred sound has the potential to heal the mind by means of chemical change at the cellular level and the benefit of the release of endorphins and enkephalins, the body's "happy hormones." As the mind becomes quieter and happier, and the brain becomes calmer, a new vibratory pattern at the cellular level can be engaged and developed. This trully creates the space for the mind to heal all wounds. A person can then develop to their full potential as a spiritual being enjoying the benefits of engaging a physical body. Health of mind, body, and spirit is thus improved and healing is occurred.